Can Science Show Us a Way To Stop Terrorism? Among the scientists who shared their thoughts on this pressing issue was Prof. Peter Turchin, founder and overall coordinator of Seshat: Global History Databank. Mr. Freeman presented prof. Turchin’s ‘radical’ idea of using history as a guide to understand why people join terrorist groups, what breeds such groups to begin with, and what to do about it now. According to Turchin, evolutionary pressures operating on groups that are extremely dissimilar—and antagonistic—promotes strong solidarity among the members of these combatant groups. Individualism takes a back seat to extreme self-sacrifice; sacrifice to the group, to the ‘greater good’ (however that is being defined), to ‘The Cause’. It is the pressure on combatant groups, the struggle for survival that breeds the terrorist’s extremism, according to this line of thought. In fact, there is good evidence for this sort of individual negation towards group solidarity. One of the other scientists interviewed was Scott Atran, professor of Anthropology at Oxford University who introduced the concept of the ‘devoted actor,’ people who become resolutely committed to a cause to the extent that they will sacrifice individual security and benefits. The quintessential terrorist. Likewise, Prof. Harvey Whitehouse, also a professor of Anthropology at Oxford University, has uncovered this practice in operation in the modern world. Prof. Whitehouse is also a Seshat Editor and is one of the world’s leading experts on the evolution and function of groups. In an article published in the Proceedings of the National Academy of Science in 2014, Whitehouse and his team analyzed data collected in the field in Libya during the 2011 revolutionary war there. 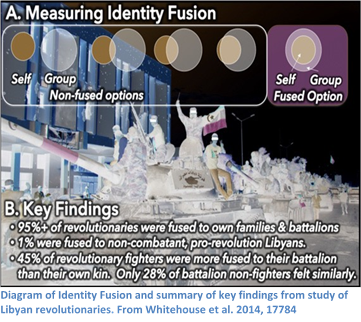 They found that the extreme circumstances faced by the revolutionaries—striving for survival, fighting alongside fellow combatants, working together to topple the Kadhafi regime—led to what Whitehouse calls ‘identity fusion.’ The willingness to fight and, possibly, die for the group and their common goal was the result of this fusion, bred by the extreme pressures involved in a struggle for survival. Turchin made this prediction based on his understanding of history and the way that pressures can build up during armed conflict against opposing groups, leading to ‘blow-back’ effects like the rise of ISIS. The episode concludes with Prof. Turchin outlining the three main options that exist for dealing with ISIS and other terrorist groups today. As Mr. Freeman explains as the episode fades out, none of the options are particularly appealing, but it is important that we have as clear an understanding of what the options actually are and what the likely ramifications of any action will be in order to make a truly informed choice. As Turchin and everyone involved in the Seshat project believe, understanding the lessons of history gives us our best hope of gaining this wisdom. Turchin, Peter. War and Peace and War: The Life Cycles of Imperial Nations. New York: Pi Press, 2005, p. 349.